The historic Old Auditorium (left), one of the early buildings on campus (from the 1920's), is currently undergoing restoration. 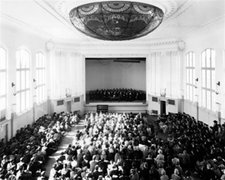 Until recently, this 600-seat facility was used for large-ensemble concerts and opera productions. In the mean time, the Old Auditorium's hall and rooms are used for rehearsals, teaching studios and offices. Official reopening events are scheduled for October 2010.